The print size is 17.875" x 24.5". 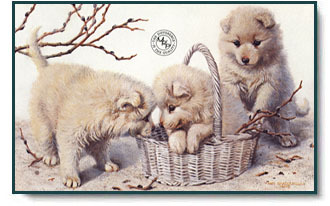 "I had been looking for a sled dog for a long time when I came across these little samoyeds. Not only are samoyeds beautiful, they're also very versatile dogs - from mushing to guiding sheep to hunting walruses. I considered getting one even though walruses haven't been seen on the ranch in quite some time. 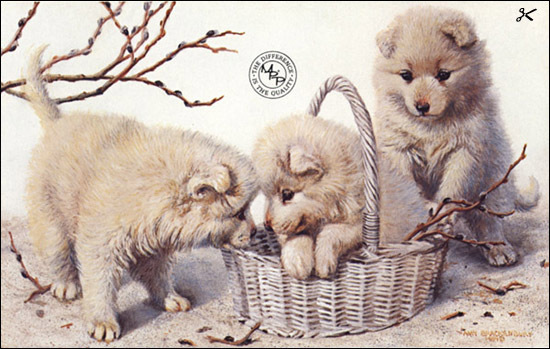 "Samoyeds, however, like all northern breeds, are known for their wandering. I want a dog to stay home, not to come staggering in with its tongue hanging out after carousing for a couple of days. After all, what if a walrus should happen by?" Basket Case copyright © 1989 by Amy Brackenbury.